When Seattle Pacific University’s distinguished lecturer, theologian Jürgen Moltmann, referred to “the lark of hope” at this year’s Day of Common Learning, I was astonished. With the poetic prompting of Emily Dickinson, I had been thinking about hope in terms of bird imagery for several months. Dickinson’s poetry has long served me as a rich stimulus for spiritual meditation, and in the last few years, I’ve been composing brief written reflections on individual poems, paying particular attention to the way in which poetic language and structure push us off the dock of reading and into the lake of meaning. The convergence of Dickinson and Moltmann at a particularly difficult period in my life has given me a new perspective on the life-affirming work of the Holy Spirit. Dickinson begins poem #314 by using quotation marks to call our attention to the fact that she’s going to try to define a profound concept that can only be approximately evoked by the four letters h-o-p-e. After opening with this linguistic symbol, the poem piles up mysterious images of a “thing with feathers” endlessly singing a “tune without the words” while “perching” in the soul. It is only in line 7 that the metaphor is openly identified as a bird, which finally explains those feathers, the perching, and the song. This concrete image of a little bird, however, evokes an unsubstantial feeling, a personal experience, a non-physical entity. The verbal image is feathery, not quite solid, like the bird of the Response cover; it pours out pure sound, not recognizable words; and it paradoxically resonates the sweetest in the middle of a howling storm. However, this little bird, let’s call it a lark, has infinite strength and power. It keeps us warm, or alive, despite icy gales and unfamiliar territories. Its song “never stops,” doubly emphasized by the dash-bracketed phrase, “at all.” The subsequent stanza break adds a third emphasis to the bird’s infinite music. 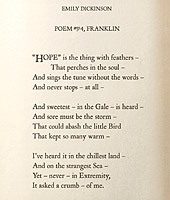 The second stanza of the poem speaks abstractly of the many people warmed by the lark of hope, but in the third stanza, the poetic speaker attests to hope’s impact in highly personal terms, shifting to the first person, I. She has heard the song of hope everywhere — on land and on sea — and in the most extreme circumstances. A second turn of ideas is indicated with the word “yet,” which introduces the final two lines. Once again, Dickinson’s signature dashes emphasize the word “never,” echoing its use in line 4. Only this time we learn that in the eternal song of the bird, it never asks anything of us. The bird could be in the most extreme situation, starving to death, and it would never ask us for even a crumb. Hope gives, but it does not ask. As Moltmann reminds us, we act out of hope because we are inspired, not required. Although this poem employs fairly simple language to depict things as familiar as birds, songs, and storms, we are nonetheless left with an impression of the profoundly mysterious nature of hope. We can explore this concept with theological categories, biblical references, metaphoric language, and even visual elements such as lines and color, but none are sufficient to capture fully the unexplainable nature of hope. Another symbolic bird of hope suggests why: The unfathomable yet all-pervasive presence of the Holy Spirit, sometimes visually depicted as a dove, informs all hope, makes hope possible, provides us with a “sure and steadfast anchor of the soul” (Hebrews 6:19). Nineteenth-century American writers commonly used bird imagery to represent the female poet and her work, so the poem also speaks to one of Dickinson’s self-perceived poetic roles — to sing through the storms of life. 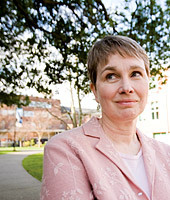 Her substantial and complex work has often given me hope in times of difficulty and crisis. When I help my students learn how to read these sometimes difficult texts, my goal is that they will find both comforts and challenges in this marvelous poetry.